Looking for something special to treat someone you love? With an Argento discount code you can enjoy fantastic savings on beautiful, unique jewellery that's sure to bring a smile to their face. Whether you want hand crafted silver necklaces and rings or the popular Pandora modular bracelets, an Argento voucher code will save you money while you shop. Founded in 1997 by Pete Boyle, a man with a passion for fine jewellery, Argento started life as a single store on Castle Street in Belfast. With a vision for a modern, casual jewellery store that welcomed people from all walks of life, Boyle created a business that went from strength to strength. Today, there are 27 Argento stores plus a thriving online business, all dedicated to selling quality jewellery at affordable prices. Originally, Argento – the Italian word for silver – stocked fine jewellery, but increasingly the store found a demand for fashion jewellery as customers wanted things to accessorise their everyday outfits, not just ultra-glamorous pieces for special occasions. When Boyle discovered Pandora bracelets on a buying trip to Australia, he was sure he'd found the next big thing – and he was right. Pandora bracelets, stocked by Argento and loved around the country, have become a national phenomena, their modular style making it easy for loved ones to buy new additions or 'beads' as gifts. With their distinct styling and wide range of styles, Pandora bracelets crop up on the wish lists of everyone from grandmothers to teenage daughters time and again. Argento's founder is an expert in the industry, and that knowledge and experience has been passed on to all of his staff. So if you're struggling to know what gift to pick out, or you just want advice on what jewellery best suits a chosen outfit, the team at Argento will be happy to help. The company's easy-to-use website offers customers the chance to browse through thousands of products by category or by brand, sorting results by material or price to easily find the jewellery that's right for you. 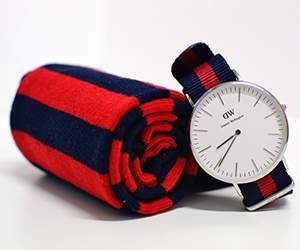 So whether you want an elegant necklace or a stylish watch, you'll find plenty of options at surprisingly affordable prices. Want to get shopping with Argento? With an Argento discount code you can enjoy fantastic savings while you shop. Whether you want to treat yourself to something special or give a loved one a gift they'll never forget, an Argento promo code is a great way to save the pennies. Enter your Argento discount code where applicable. Want to find out more about the beautiful products on offer at Argento? Why not pay a visit to the company's dedicated YouTube channel here? You'll find lots of exclusive content including video gifts guides, product features, new collection previews and more. You can also use this channel to find out more about saving money with Argento voucher code. If you've enjoyed shopping for beautiful gifts and treats with Argento, you might like to browse great deals on more jewellery in stores like Debenhams or Marks and Spencer. Or, if those aren't up your street, you'll find plenty more stores in our Fashion, Accessories and Jewellery section. Fashion, Accessories & Jewelry category offers plenty of vouchers and coupons for bargain-hunters. One may find codes for the most popular shops such as Debenhams, Next and many others. Browse our website until you find an Argento discount code that suits you, then navigate to their website to begin shopping. Enter your Argento discount codes where applicable. Fill in your details and click 'Submit and continue'. Choose your postage and click 'Proceed to payment details'. Fill in your payment details and click 'Pay by card' to complete your order. Standard UK delivery is free on all orders. Next day and express delivery is available at a fee. If you need to return a product for any reason to Argento, simply complete the returns form on the back of your invoice and return your item within 90 days of receipt. Need to contact the team at Argento? Whether you have a question about your order, want some advice on buying the perfect gift or you simply want to find out how you could save money with an Argento voucher code, you can contact the Customer Services department by telephoning 0845 366 4224. Want to find out more about what's happening behind the scenes at Argento? The company maintains a profile across all the major social media platforms. Follow them for plenty of entertaining content such as competitions, fashion tips and idea, styling inspiration, special offers and much more. You can also use these pages to find out more about saving money with an Argento discount code. Buy now online at www.argento.co.uk/. 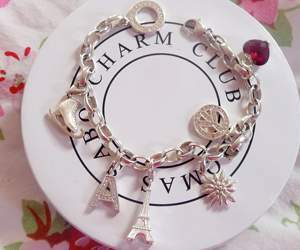 I really wanted charms for my Pandora bracelet for my birthday, but didn't want my husband to spend a fortune. So I left an Argento discount code out for him to find! 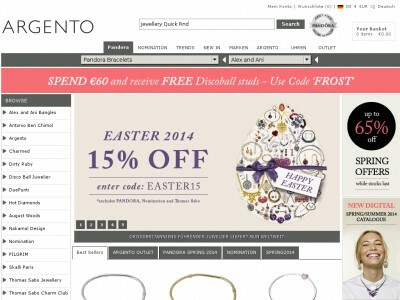 With an Argento voucher code, you can enjoy great savings on Pandora jewellery and more at argento.co.uk. Luckily he got the hint – and now I have a lovely bracelet to flaunt thanks to Argento discount codes. So if you want to treat someone special, see what you could save with an Argento promo code.